Retail Price: $47.50 Log in for LOWEST PRICE! Winemaker Kenneth Juhasz is the son of a Hungarian refugee who survived the revolution to raise a family in the United States. Kenneth learned resolve and fortitude from his father, and it has paid off for both of them. After college, Kenneth backpacked through Europe with his twin brother, John, and ended up in Burgundy. That's all it took. Once you taste great Burgundy, most agree that there is nothing like it. And so, the pursuit began. Kenneth went to Oregon, where he made his first Pinot Noir. 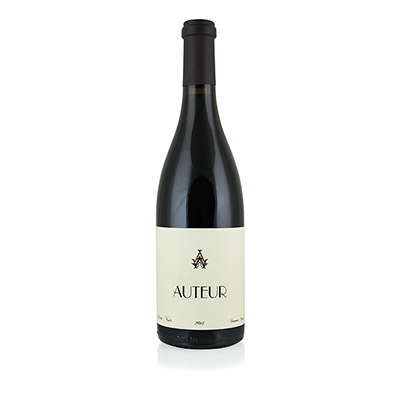 From there, he sojourned to New Zealand and then, finally, to the Sonoma Coast, where he founded Auteur in 2003. He focuses on the Burgundian varieties of Chardonnay and Pinot Noir, searching out the areas of Sonoma that are coolest, with the sparsest soil for his grapes. Vineyards near the coast whose soil contains million-year-old sea matter are the best. Pinot Noir means "black pine cone" in French. It is so named because it is black in skin color and the clusters resemble a pine cone. Though the skin is dark, it is also very thin, which is why the wine should be lighter in color than, say, Cabernet Sauvignon or Syrah. When it isn't, that means the wine was fermented so cold that it took longer and, thus, darkened the wine. Kenneth will have nothing of that, as it loses the delicacy and piquant flavors of what Pinot Noir is supposed to be. And our selection is certainly everything Pinot Noir is supposed to be.